The arrival of Summer is celebrated by the Festival of San Juan (St. John) in many places throughout Spain and indeed the world. Javea on Spain’s Mediterranean coast in the Comunidad Valenciana is no exception. It is a festival with an ancient origin which combines magic rituals with fire, gunpowder, water and music. All designed to welcome the Summer. The fiesta in Javea traditionally lasts from 10 days to 2 weeks, always ending on the night of 24th June (Día de San Juan). The fiesta program is drawn up by youngsters of the town who spend the whole of the preceeding year fundraising to help pay for the festivities. Of course, the Town Hall also contributes a substantial amount! 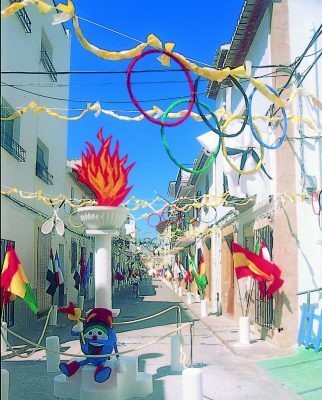 Events include sporting activities, a chess competition, parades of the festival Queen and her court around the town, a grand parade of floats on the last day, musical performances, concerts, a spectacular offering of flowers to the Church (23rd June), bull running in the street, the infamous “correfoc” (firework parade with fire crackers going off constantly as the parade winds its way through the streets). The fiesta ends on the night of 24th June with a magnificent firework display to music in the centre of town followed by the burning of the giant papier maché statues. And almost every night there is dancing in the street or the main square to either live music or a mobile disco. These go on into the very wee small hours!